CILS provides legal assistance to tribes with Indian Child welfare cases. 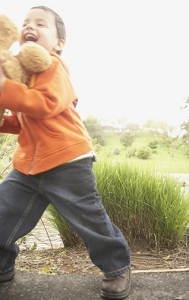 Keeping children safe is our priority. CILS also had several cases that benefit all 578,623 Native Americans in California. For more than fifty-one years, CILS has provided legal assistance to Indian tribes, organizations, and individuals who may have otherwise gone without adequate representation. CILS has successfully asserted and defended the most important rights of Indians and tribes in hundreds of major cases and has achieved significant results in such critical areas as tribal sovereignty, natural resource protection, and Indian education. Sharing is a Native American tradition. We invite you to participate in this tradition by contributing to CILS. With your support, CILS can continue to achieve justice on behalf of Native Americans. 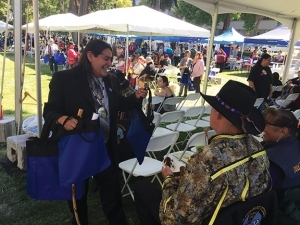 Mark Romero, Chairman of CILS Board of Trustees, handing out gift bags to honor elders at the California Native American Day celebration. CILS is one of the oldest not-for-profit law firms in the country that is devoted exclusively to the cause of Native American rights in California. Governed by a Board of Trustees and endorsed by California tribes and tribal organization, CILS has provided free and low-cost legal services to California tribes, tribal organizations, and Native American individuals throughout the State since 1967. CILS maintains four offices throughout California and is supported by grants from the Legal Services Corporation, Department of Justice, State Bar of California, private foundations, and individual and corporate contributors as well as contracts from a host of California’s 110 federally recognized Indian Tribes. CILS is proud of our many significant achievements over the last five decades including significant Supreme Court and legislative victories in the areas of Indian child welfare and cultural resource protection, securing federal recognition for dozens of California tribes, hosting numerous statewide conferences on Indian law issues, and the successful resolution of thousands of legal issues for Indian individuals, families, tribes, and native organizations. CILS focuses on the following priorities: (1) preserving and enhancing the Indian land base; (2) securing self-determination; (3) ensuring the restoration of services; (4) achieving bureaucratic accountability for government policies, actions, or omission; and (5) protecting Indian heritage and culture. When first visiting AmazonSmile, customers are prompted to select a charitable organization from almost one million eligible organizations. To browse or shop at AmazonSmile, customers must first select a charitable organization. For eligible purchases at AmazonSmile, the AmazonSmile Foundation will donate 0.5% of the purchase price to the customer’s chosen charitable organization.